Our research comprises experimental studies on complex nanostrcutures, e.g. 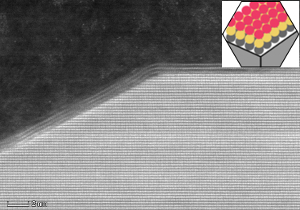 thin films, emergent 2D materials, 1D metallic systems and organic hybrids. A comprehensive characterization regarding atomic structure, electronic states and electronic transport properties is maintained by using electron microscopes and scanning tunneling microscopy-based techniques. 2D materials has been the subject of a scientific explosion since graphene, the first exfoliated two-dimensional (2D) material with the advantages of very high surface-to-volume ratios, could exhibit unique and fascinated physical properties. 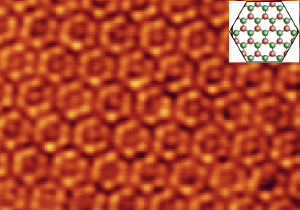 Recently, beyond graphene, the family of 2D materials (e.g. MoS2, BN, WSe2, etc.) which offers a huge flexibility in tuning of their electronic properties (from dielectric, semiconducting, to metallic, even superconducting behaviours), is promising candidates for potential applications in new-generation electronic devices. Our research interests centre investigating the nanoscale growth as well as characterization of atomic, electronic structure and other interesting properties of 2D materials by means of efficient and valuable multilevel tools (STM, AFM, TEM, etc.). The electronic properties of low-dimensional systems are closely related to their geometric struc­ture. Electron confinement is of high importance in one (1D) and two-dimensional (2D) structures leading to strong correlations between electrons and to significant deviations from Fermi liquid behavior, sometimes better described by a Luttinger liquid competing with phase transitions giving rise to metal-insulator transitions. Moreover, the strong entanglement of electronic correlation and spin-orbit coupling results in new states of quantum matter. Such ultimate atomic 1D structures can be realized by self-assembly of monolayer and submonolayer structures of various atoms on (vicinal) semiconducting substrates, e.g Pb/Si(557), Au/Si(553). Besides, also lithographic-based, top-down techniques are used. For instance, the annealing of mesa-structured SiC(0001) surfaces results in growth of graphene nanoribbons with ballistic and spin-polarized transport channels. Thin films are building blocks for modern material-based research and applications (lightweight constructions, data storage, etc.). For instance, the possibility of co-deposition and tunable growth on various substrates allows to fabricate condensed matter phases with new physical bulk properties but also defined interface and surface structures. Therefore, we look in detail for defects (grain boundaries, chemical composition) as well as surface and interface structures. Besides TiNa alloys, epitaxial Bi(111) films and topologically non-trivial BiSb(111) films on Si(111) are currently investigated. 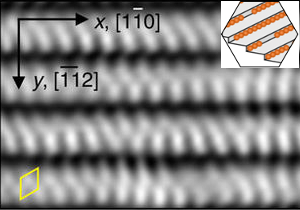 For the latter the confinement and interaction of the bulk bands with the spin-polarized surface states are currently of interest. The current research activity for molecules on surfaces is strongly triggered by the research field of molecular electronics. However, the transfer a molecular functionality is strongly influenced by the interaction of the molecule with their substrates and electric contacts. 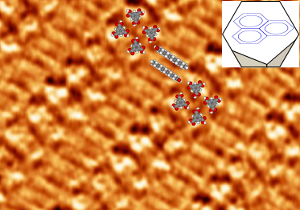 In our group we are interested into surface chemical aspects and surface reactions in order to grow molecular networks with new properties but also to functionalize interfaces. Tunneling microscopy and spectroscopy is used to map out the structural and electronic parameters on an atomic scale. Moreover, lithographically made contact structures are used to measure the transport through single molecules.